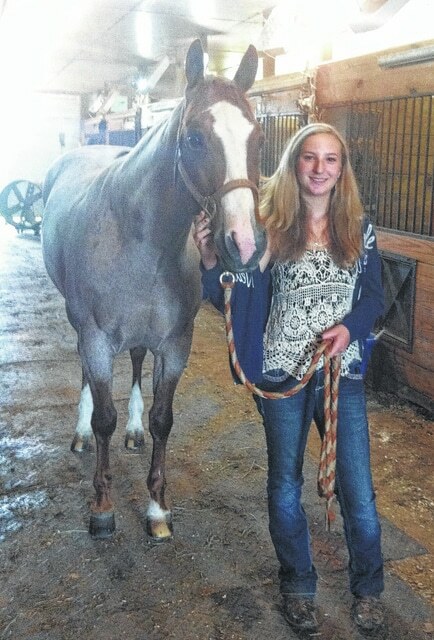 Delaware Hayes High School sophomore Riley Geiger has horse riding in her blood. Riley Geiger recently won the championships of the Western Pleasure class at the All American Youth Horse Show, which was held at the Ohio State Fair grounds in Columbus. She explained that the Western Pleasure class of the horse show is “based on the horse’s movements.” The horses are asked to perform three gaits: the walk, trot and lope. Geiger’s horse, Ranger, is 7 years old. He has belonged to Riley since he was 4 years old. Ranger, officially named Hot Roddin’ Ona Ranger, is a red roan horse. He has a red mane and his body is covered in a mix of red and white fur that makes him look as if he is passing through the salt-and-pepper stage of going white. “It’s taught me about life and sportsmanship and everything,” she added. Ryan Geiger feels that horses make a great hobby because, unlike many other sports, “you can always pick it up whenever you want to, at any age.” To illustrate the point, he mentioned family friends, also in the horse industry, who have an 80-year-old client. Riley Geiger might someday emulate the octogenarian horseback rider. “I’m gonna try to stick with [riding horses] as long as I can,” she said.